Verdigris River - A tributary of the Arkansas River in southeastern Kansas and northeastern Oklahoma, it is about 280 miles long. It has a history dating back more than two centuries -- mentioned by Zebulon Montgomery Pike during his visit to the area in 1806 and also by Thomas Nuttall in 1818. The river flows through a rich country that in early days produced much in the way of furs. A number of trading posts were located along its course from time to time, the most important of which was probably that operated by a man named Hugh Glenn in 1819, located at a point about a mile above its confluence with the Arkansas River. Chief Clermont's band of Osage Indians was located on the stream about this time and is mentioned by Stephen H. Long in his travels. By the treaty of 1834 with the Cherokee Indians the Verdigris River was named as a part of the boundary of their lands. The name is derived from the French words vert, meaning "green," and gris, meaning "grey." Oklahoma, David Alexander, June, 2004. The stream has its source in several small streams, one of which rises in eastern Chase County, one in northern Greenwood County and two in southern Lyon County. It flows in a southeasterly direction across Greenwood County, the extreme southwestern corner of Woodson County, Wilson and Montgomery Counties, entering Oklahoma almost due south of Coffeyville. From there the stream flows through the counties of Nowata, Rogers and Wagoner, Oklahoma, uniting with the Arkansas River near the town of Wybark, about three miles from Fort Gibson. Among the more important tributaries of the Verdigris are Willow, Homer, Sandy, Drum, Big Hill, Pumpkin and Onion Creeks, and Paw and Fall Rivers in Kansas, and Big Caney and Little Verdigris Rivers, Bird Creek and about two dozen smaller streams in klahoma. Dams built by the U.S. Army Corps of Engineers cause the Verdigris River to form Toronto Lake near Toronto, Kansas and Oologah Lake near Oologah, Oklahoma. 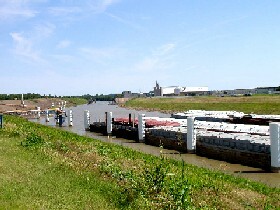 From just north of Catoosa,Oklahoma to its confluence with the Arkansas River, barge traffic is maintained on the river as part of the McClellan-Kerr Navigation System, which consists of a series of locks and dams on both streams and allows commercial navigation between the Tulsa area and the Mississippi River. 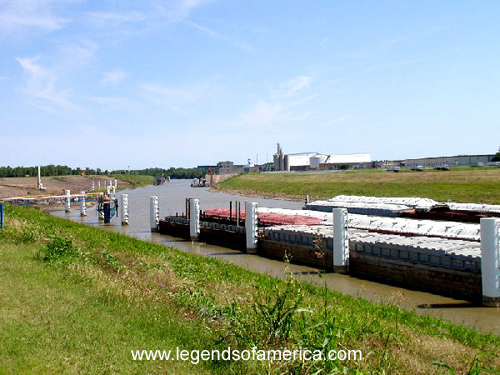 Wakarusa River - A tributary of the Kansas River, the approximately 50 mile long waterway is situated in eastern Kansas draining an agricultural area of rolling limestone hills south of Topeka and Lawrence. It rises from several branches located southwest of Topeka, the main branch coming from the Wabaunsee-Shawnee County line, approximately 10 miles southwest of Topeka and flowing east. The south branch rises in eastern Wabaunsee County, approximately 15 miles southwest of Topeka and flows northeast, joining the main branch south of Topeka. The main branch flows generally east, flowing south of Lawrence and joins the Kansas River in Douglas County at Eudora, approximately eight miles east of Lawrence. One of the earliest mentions of the water way was by Stephen H. Long, the explorer, in 1819. The name is said to come from an Indian legend, which says that a maiden, during a time when the stream was overflowing, sought to cross the the waterway on horseback. As she proceeded across, the waters became deeper and deeper, until her body was half immersed and she exclaimed, "Wakarusa! ', meaning hip deep. This river was first inhabited by various Native American tribes, including the Kanza and Osage in the 18th century and after the U.S. acquired this region, the Shawnee people were relocated here. The Methodist Episcopal mission was located near the mouth of the stream in about 1842. John Charlton, courtesy Kansas Geoogical Survey. During the Great Migration of 1843, the fords used for crossing this meandering river were among the many challenges emigrant wagon trains had to master along the Fremont-Westport Trail, which was later called the California trail during the 1849 gold rush. Also traveling along the river were wagon trains along the Santa Fe and Oregon Trails Several Shawnee Indians created ferry operations at river crossings in the 1850s, including Blue Jacket's Ferry near Coal Creek at Sebastian. During the troublous times of the early territorial days the region along the Wakarusa River was the scene of much strife between the pro-slavery and free-state forces, the celebrated "Wakarusa war" being fought there on November 27, 1855. 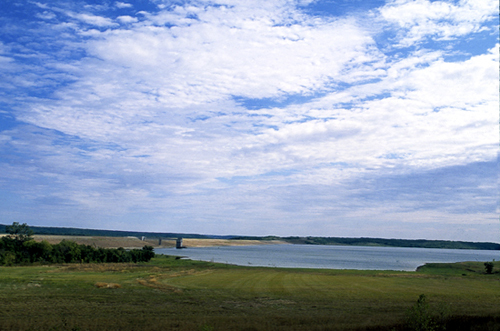 Clinton Dam, located near Lawrence was completed in 1977 to reduce seasonal spring flooding. Though this greatly reduced the replenishment of wetlands below the dam, a remaining tract of 600 acres, known as the the Haskell-Baker Wetlands, is located south of Lawrence near the Haskell Indian Nations University. Walnut River - Situated in southeastern Kansas, the Walnut River has its source in two forks which rise in the northern part of Butler County. Cole and Durechon Creeks unite at a point about a mile southwest of the village of Chelsea to form the waterway, which was known in the past as the "Little Verdigris River." It flows in a southwest direction past the city of Eldorado, Augusta, and Winfield before making a turn almost due south and emptying into the Arkansas River south of Arkansas City in Cowley County. The river has a number of small tributaries, the most prominent of which are the Whitewater River on the west and the Little Walnut and Rock Creeks on the east. The river is approximately 121 miles in length, making its way through the Flint Hills region of Kansas. Upstream of El Dorado, a U.S. Army Corps of Engineers dam causes the river to form El Dorado Lake, along which a Kansas state park has been designated. Whitewater River - Also known as Whitewater Creek, the stream is situated in southern Kansas. The waterway rises in the southern part of Marion County about six miles west of the village of Burns, flows south and unites with the Walnut River at a point about a mile south of the town of Augusta in Butler County. The stream has only one tributary of consequence -- the West Branch Whitewater River, which has its source near the town of Walton in Harvey County, and unites with the Whitewater a little north of the village of Towanda in Butler County. The length of the stream is about 35 miles long. During the 1860s, a man named James R. Mead of Wichita had a ranch and trading post on the Whitewater River, where the town of Towanda now stands. In 1868 the Nineteenth Kansas Cavalry, while on the march to the Indian Territory, stopped at Mead's Ranch for supplies on the evening of November 11th. Wolf River - A tributary of the Missouri River in northeastern Kansas, it rises in Brown County, approximately three miles north of Powhattan. It then flows generally eastwardly into Doniphan County, past the communities of Robinson, Leona, and Severance. Near Severance, the river turns northward; it flows into the Missouri River approximately eight miles southeast of White Cloud. Throughout the years, the waterway has also been known as Wolf Creek, Petite Riviere de Cansez, Riviere du Loup, and Shun-ta-nesh-nanga. Compiled and edited by Kathy Weiser/Legends of Kansas, updated June, 2015. Kansas Historic Book Collection - 35 Historic Books on CD - The Historical Kansas Book Collection is a collection of 35 volumes relating to the history of Kansas and its people primarily in the 18th and 19th centuries. Several of the volumes have great period illustrations and portraits of relevant historical figures. Includes such titles as the History of Kansas (1899), History of Kansas Newspapers (1916), All five volumes of A Standard History of Kansas (1918), Pioneer Days in Kansas (1903), and dozens of others.